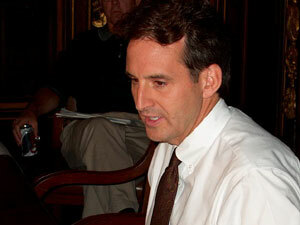 MPR: Pawlenty: Moderate or right-wing conservative? What happened to the DFL? Is Minnesota still number 1? Pawlenty: Moderate or right-wing conservative? Two of Gov. Tim Pawlenty's most important assets are his winning smile and his easy disposition. Even his biggest critics say it's hard not to like him. But political opponents are quick to charge that behind the friendly demeanor lurks a radical agenda that is steering Minnesota off course. Pawlenty and his allies, however, point to crushing victories at the ballot box last year as evidence that their roadmap is exactly what Minnesotans want. St. Paul, Minn. — Gov. Pawlenty didn't win election with a majority. But in a four-way race his 44-percent plurality was a comfortable margin that he and running mate Carol Molnau seized on as a mandate. On election night he quipped, "I'm not going to be the governor, and Carol's not going to be the lieutenant governor, of 40-some percent of the people or 60 percent of the people or 80 percent of the people. We're going to be the governor and lieutenant governor for all the people in Minnesota." Since then, Pawlenty has advertised his agenda as a moderate response to challenging times. His no-new-taxes pledge, he said, was no different than a family's pocketbook economics -- live within your means. He likewise portrays his positions on abortion and guns, education and transportation as middle-of-the-road. But former Republican governor Arne Carlson says neither Pawlenty nor rival Brian Sullivan offered moderation last year during their fight for the Republican nomination. "Both Sullivan and Pawlenty presented themselves to the delegates as hard-core conservatives," says Carlson. "They were not at that time taking a public position that said, 'Hey, I'm the moderate candidate.'" Carlson, along with fellow Republican former governors Elmer Andersen and Al Quie, criticized Pawlenty this year for moving too far to the right with his no-new-taxes pledge. Pawlenty says he isn't shy about the conservative badge, nor is it evidence of extremism. "Again, I'm not running away from the label that I wanted to be the Republican standard-bearer or that I'm a conservative," says Pawlenty." "But people shouldn't equate being conservative with being mindless or stupid or thoughtless or uncaring." Sullivan, too, says conservative ideals can mix comfortably with mainstream politics. Sullivan says Pawlenty has done an outstanding job in his first year in office. Again, I'm not running away from the label that I wanted to be the Republican standard-bearer or that I'm a conservative, but people shouldn't equate being conservative with being, you know, mindless or stupid or thoughtless or uncaring. "Holding the line on taxes, improving the quality of education by raising academic standards in our schools, reforming the agencies, and how they deliver those services: those are conservative ideas, but those are absolutely in the mainstream," says Sullivan. Former governor Carlson, who never won Republican endorsement even as an incumbent seeking re-election, says the issue that may cut into Pawlenty's moderate reputation is his support for legislation broadening the availability of handgun permits. After signing the measure, the govenor unsuccessfully attempted to reopen debate to remove a controversial provision. Sen. Wes Skoglund, DFL-Minneapolis, says the governor's rush to sign the bill, followed by his attempt to reconsider it, suggests that Pawlenty is a captive to conservative interests. "What do you need a gun in church for?" asks Skoglund. "What do you need a gun in the nursing home for? What do you need a gun at the State Fair for? I mean, what do you need a gun there for?" But lobbyist Joe Olson of Concealed Carry Reform Now says it's unfair to characterize the handgun bill as part of a right-wing agenda. "What happened was the Legislature, through hearings that extended over a period of about four years, actually got to understand the legislation, they got to understand the issues," says Olson. "And I think that when they passed the bill, the vast majority of the Legislature was very happy with it." Mandate or not, Pawlenty was remarkably successful this year, prevailing on just about every key policy item in his agenda. Political science professor Dan Hofrenning of St. Olaf College says it's not clear if most Minnesotans will judge that agenda as radical. But he says Democrats appear convinced they will. Hofrenning says the essence of the Democratic strategy was to give ground on most fronts in order to lay the consequences squarely on the Republicans' doorstep. "To in effect say, 'You can have it,'" says Hofrenning. "'You can have the policy victory, and we're going to believe that the public is not going to like it and the public will hold you accountable in 2004.'" Pawlenty isn't up for re-election until 2006. But in 2004 all 134 House seats are up, providing at least an indirect test of the governor's vision.